You’ve just found a software engineering job offer of your dreams. Great pay, amazing benefits, exciting projects, and, oh God—look at the specs of their computers! That’s what you’ve been waiting for your whole professional life. You know you’d be a great fit. You’ve got the skills and experience they’re looking for. You know they’d have to be crazy not to hire you. Wait a minute! A cover letter?! Right, so I’ll need to send the generic copy-paste software engineer cover letter I’ve written back in the day, and I’m good to go. Nobody’s gonna read that thing anyway. That’s what most of your competition is thinking right now. And that’s why you’ll beat them. Because you’re about to learn how to write a software engineer cover letter that gets every employer hooked and lands you that dream gig. A software engineer cover letter sample better than 9 out of 10 other cover letters. Proven, effective templates and formulas for writing the best software engineer cover letter in the pile. How to describe your experience in a cover letter for software engineering positions and get any job you want. Here’s a sample software engineer cover letter written in response to a Software Development Team Lead position. Two months ago, I shattered a record I had previously considered unbreakable. My solutions for developing and optimizing ABC’s flagship apps and online software helped increase annual mean NPS to a staggering 61.8 (37% increase.) Soon after that, I came across the opening for Software Development Team Lead at XYZ Corp. As a lifelong fan of your cutting-edge software solutions, I immediately knew that this post was the perfect match for my skills and expertise. 3 out of 4 apps I developed in 2017 have been rated above 4.7 stars in both AppStore and Google Play. Upgraded premium versions of our products increased quarterly revenue by 86% in 2017 Q4. New Help Desk solutions cut Customer Effort Scores by 31%. With more than 10 years of experience in software engineering, I am positive I can help XYZ Corp achieve similar results. End User Satisfaction has always been the single most important KPI for measuring my teams’ performance. I know that this value is also the cornerstone of XYZ’s mission and vision—that’s why I was so excited when I first saw your opening. When can we schedule a meeting and discuss how my success at ABC can translate into IT Happiness growth for you? P.S.—I would also value the opportunity to tell you how I optimized ABC’s beta-testing workflow to double the Timely Project Delivery scores. Tabitha is going places. And so can you. Let’s break down what makes the above cover letter for a software engineer so great and how you can make an equally great one yourself. Software Engineer Cover Letter for a Resume—See more cover letter templates and create your cover letter here. So you’ve seen a jaw-dropping software engineer or software developer cover letter. What is it exactly that made the hiring manager’s jaw drop? Tabitha’s achievements? The writing quality? Yeah, these are important. But not as important as an effective, reliable cover letter writing formula Tabitha’s applied. 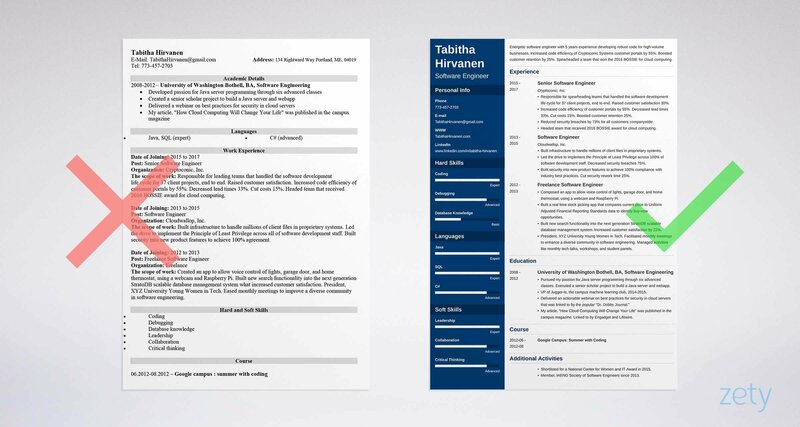 You can make this template for a cover letter work for you as well! Your names, professional title, and contact info. City and date are optional and a tad old-school, but more conservative readers will appreciate them. “Dear [Hiring Manager’s name] is perfect. “Dear Sir or Madam” is stiff, boring, and really old-fashioned. Begin with “the hook.” Tell your employers a quick story that shows how impressive your skills are. Make an offer. Emphasize how your expertise will help solve their problems. Use bullet points to outline your achievements. Reiterate your offer and ask them to reach out to you. Gently remind them that you’re not going to be available forever. It works like an eye magnet. In it, include something you can’t afford for your prospective employer to miss. Be specific and precise. Quantify whenever possible. Numbers pop! So that’s what you should include in your software engineer or software developer cover letter. Don’t know how long your cover letter should be for a software engineer position? No longer than necessary to show off your best and most relevant wins. Looking for an exact figure? This will depend on your experience. Cover letter for a software engineer with 2 years of experience or less shouldn’t exceed 200 words. Experienced software developer cover letter? Not much longer. Aim for 300 words, tops. These few sentences at the beginning of your cover letter are critical. Get the intro right, and the hiring manager will be excited to read on. Mess it up, and no one will even cast a glance at the rest of your letter. How to make the most of your software developer cover letter introduction? Begin with Dear + the hiring manager’s name. If you’re applying to a company with relaxed office culture, first name will do; if your prospective employer is more traditional—go for first and last names. Mention your impressive achievement and tell a catchy story about it. Nothing too fancy—remember Tabitha? That’s how she did it: Two months ago, I shattered a record I had previously considered unbreakable. Make them realize how much they’ll benefit from hiring you. Personalize. Refer to an important company fact, show your enthusiasm and passion for the company’s values, mention current events, or use name-dropping if you’ve been referenced. Want to have a look at how it works in practice? Check out these very different examples of full-stack software engineer cover letter intros. 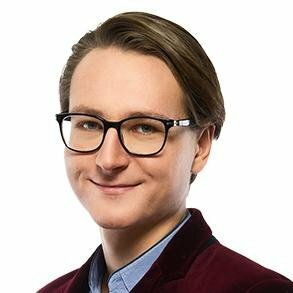 As a full stack software engineer with 8 years of experience in technical software development, I’d like to express my interest in applying for the position of Senior Software Developer with your company. Well, okay. In his case, I’m Bill Gates, would do the trick. Since you’re reading this, I’m assuming you’re not Bill Gates. Yet. So here’s an example of a software engineer cover letter intro that could help you move your career in the right direction. That kind of cover letter opening is going to make the hiring manager call you in the middle of the night! First of all, the initial storytelling part. It’s intriguing and, at the same time, super relevant to the job. Secondly, this computer software developer cover letter intro is focused only on the employer’s benefits instead of the candidate’s gain. Remember—in your software engineer cover letter, show the employers that they need you. Not the other way around. Finally, it refers to an important company fact. That shows that the candidate has done his research. It adds this precious personal touch. 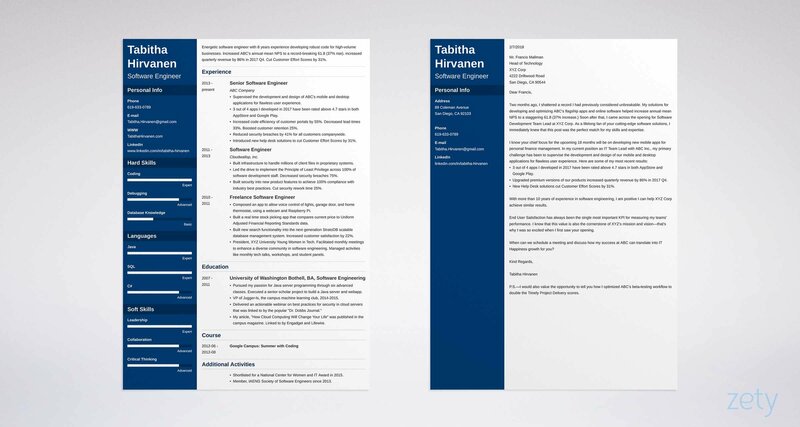 Software Engineer Resume Example - See +20 resume templates and create your resume here. Alright, so you’ve crafted the perfect intro. You’ve got their attention. Time for the serious sales pitch—the central paragraphs. The make-or-break moment of your application. You need to tailor every cover letter for software engineering positions to the particular job you’re aiming at. Remember how our candidate, Tabitha did it? She applied for a senior software engineering position with a company that planned to launch new mobile apps. How did she convince the hiring manager that she’d be the perfect fit? She went for a three-step formula that you should use in your software engineer cover letter too! Point out that you’re aware of your prospective employer’s needs and upcoming challenges. Show how your past experiences match the position’s requirements. It’s a good idea to use bullet points here to make your message more concise. Reiterate the value you’ll bring to the company. Don’t have Tabitha’s wealth of experience? No matter. Whether you’re writing a junior software engineering cover letter with 2 year experience, or even a software engineer cover letter as a fresher, the central paragraph formula remains the same. If your best asset is your education, lead with it. Success with freelancing projects? There you go. Even an impressive Github portfolio can sell you to potential employers. Need a sample software engineer cover letter for an entry level position? Since you’re searching for an enthusiastic software engineer with the ability to develop highly innovative .net applications (company’s needs), I’m happy to submit my application. Identify the company’s needs and refer to them in your software engineer cover letter. Remember: personalization works wonders! Briefly explain your motivation. This is where you’ll need to flatter them a bit. Tell your prospective employer what you find valuable in the way they run their business. Identify the company’s core values and say they’re important to you too. Just like our candidate, Tabitha, did. Remember? Long story short: ask yourself why you want to work there and say it in a concise sentence. So far so good. The hiring manager’s reading your cover letter. She’s getting more and more eager to call you in for an interview. Don’t squander this opportunity. End your letter in a way that makes it impossible to forget your application. Include a “call to action:” tell your employers you’d like to meet in person to discuss how you can help them achieve their goals. Ask them to reach out to you. Close with a “sincerely” synonym and sign the letter with your full name. Include a postscript: give a sneak-peek of your impressive achievement and say you’d be happy to talk about it in more detail. When can we schedule a meeting (call to action) and discuss how my success at ABC can translate into IT Happiness growth for you? Avoid coming off as needy. In your software engineer or software developer cover letter ending, don’t nag the hiring manager to call you. Make it irresistible for them to do it. Need more examples? There you go. I would greatly appreciate if you gave me a chance to show how well I could fit into your company structure. I am sure I would make a great employee! Just give me a shot. The bottom line is basically: Please, please, please, give me this job! Can we set up a meeting next week and have a chat about how my solar energy getaway solutions could cut Tesla Energy Software’s expenses by a quarter? P.S.—My embedded software solutions enhanced efficiency, stability, and scalability of Hubbell Inc. system resources by 35%. If it sounds interesting to you, I would love to tell you more about it. Wow, this guy’s a live wire! I can’t wait to hear his ideas! This software engineer cover letter ending would make Elon Musk himself say that. Because it provides value. Simple as that. Writing a software engineer or a software developer cover letter that gets you the job doesn’t have to be hard. Just follow the key strategies we covered. Address the hiring manager by his or her name. Get them hooked in your first paragraph. Use bullet points to show off your best wins. Be specific and always choose numbers over descriptions. Highlight what you’ve got to offer, not what you want out of the job. Include a postscript after the formal sign-off. Hungry for more cover letter writing advice? Still unsure how to describe your experience to come across as a software engineering rockstar? Give me a shout in the comments and I’ll get back to you!